The tree experts of the Main Line were in need of new branding. They came to our agency and the design team completed research to uncover how to make this John B. Ward stand out from the competition. Once the brand was in place, I worked with the team to design vehicle wraps, a variety of apparel, including tshirts, hats, and jackets, marketing materials, web media, a social media plan to bring their company more awareness, and more. With constant communication between the vendor, client, and myself, I helped manage the immense project of designing for a large fleet of vehicles. One of the best parts is I often see these trucks on my commute! The unique full wraps, the extended branding, and the bold contrast makes them immediately recognizable as John B. Ward. Each apparel design order was handled by myself and another member of our team. We communicated with vendors on samples, stitch count, colors, and final products to ensure our client received the best quality. Several designs were used over the years. We started with branding t-shirts, sweatshirts, vests, and jackets. We made sure there were some heavy-duty options for workers who spent most of their days outside no matter what the temperature was! We also made custom t-shirts to celebrate the John B. Ward’s 60th anniversary and embroidered jacket sleeves with a design I created that marked how many years each employee was a part of the company. During my time at the agency, John B. Ward & Co. celebrated their 60th Anniversary. 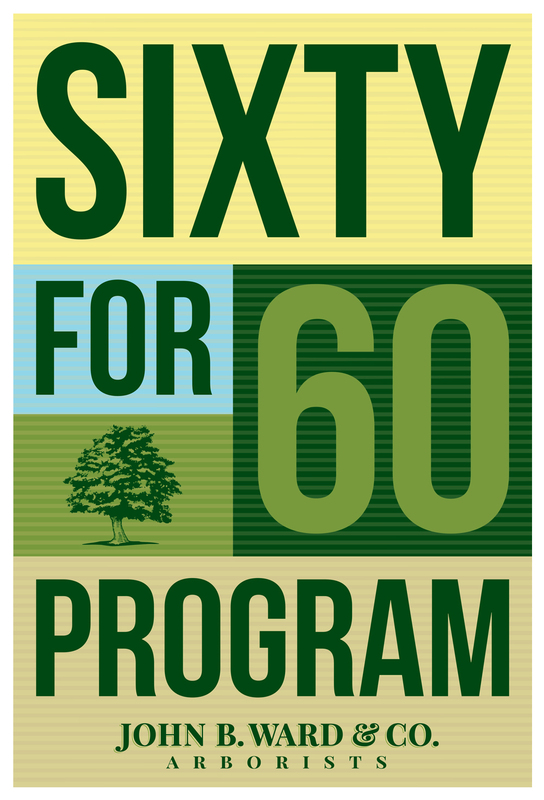 In honor of this, they pledged to plant 60 trees for 60 clients as a way to express their appreciation for the support of their clients and community. These trees were planted in locations such as schools, non-profits, public gardens, and churches. I created this logo lockup to be the face of the program on print, web, and social media designs.